Patty and I had a fun evening Saturday night. 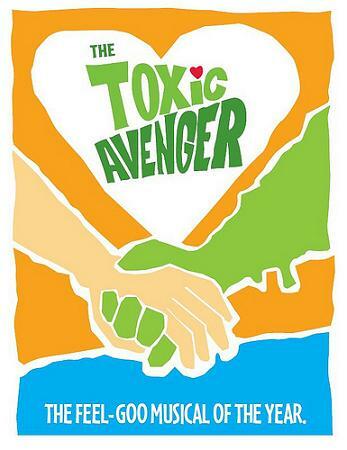 We went to see The Toxic Avenger, a musical comedy playing at the Alley Theater downtown Houston. It’s a lighthearted play with 5 actors playing about 3 characters each, which is part of the fun seeing how quickly they get into the next costume. The main character for the Houston performances is American Idol alum Constantine Maroulis , along with Nancy Opel, though each of the other actors ought to get full credit too. It’s a story of a nerd who can’t get the girl, tries to fight toxic waste but ends up getting thrown into a big barrel of the toxic goo. He’s transformed into a Super-Hero, crime-fighter and works to save New Jersey and win the girl. It was very well done, never too campy, and allowed the actors to show off just how good they were. This was no community theater. This was Broadway quality. The play runs through February 2012. Here’s a short trailer from the New York production of the same play. This entry was posted in Music, Travel and Destinations and tagged Alley, Avenger, comedy, Constantine, Houston, Maroulis, musical, Nancy, Opel, play, theater, Toxic. Bookmark the permalink.